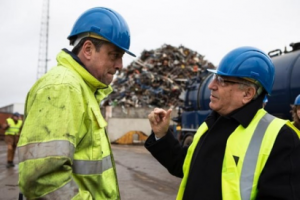 On January the 8th, an EU delegation led by EU Commissioner Karmenu Vella, responsible for Environment, Maritime Affairs and Fisheries, visited the Galloo yard in Ghent. Mr Vella was guided through the yard by Director of the yard Peter Wyntin. Peter Wyntin showed him the various measures that have been taken to enable sound and safe recycling. He explained him that only through huge and costly investments these facilities can operate in a responsible way. He referred to the illegal exports of end of life ships from the EU(flag) and stated that those exports harm the competition position of responsible yards severely. After the visit, Mr. Vella was informed about the figures of the Galloo yard. Secretary General lSRA Bernard Veldhoven and Director Reinoud Pijpers used this opportunity to thank him personally for the progress made on the EU- list. They emphasized that the EU Regulation and its Technical Requirements are good instruments for the accession on the list. They underlined a correct application of the requirements. Mr Vella stressed the need for ISRA to expand their members, so that ISRA represents a broad basis for sound and safe ship recycling. “For too long, EU vessels have been dismantled in poor environmental and social conditions. This is not acceptable any longer. The full entry into force of the EU Regulation on ship recycling is a milestone for this sector, as it provides for the first time clear and specific rules on how EU-flagged vessels should be recycled. Like other recycling activities, ship recycling can be carried out sustainably, in a way which is good for workers, the environment and the economy. This is what is happening at the Ghent ship recycling yard and this is what the EU aims at. We count on all actors in the sector to work constructively with us to make it happen”.